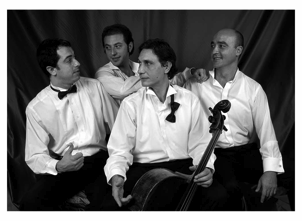 Cellistanbul Quartet was formed by a group of cellists who graduated from the same conservatory and continued their education abroad in different countries. Founded by Murat Berk and inspired by the city Istanbul that has a magical atmosphere and a rich history, group named itself as Cellistanbul. Their repertoire includes classical and modern works as well as tango and jazz. Çağ Erçağ, entered Hacettepe State Conservatory in 1985 and had the opportunity to work with Jozsef Györfy and Prof. Doğan Cangal. In 1996, Erçağ graduated from the conservatory and was accepted as a graduate assistant in the same school. During his study, he participated in the Mediterranean Youth Orchestra based in France and played in the master class of Lluis Claret and Raphael Wallfish. Erçağ won the principal cellist position in Antalya State Symphony Orchestra in 1999 and remained there until he was invited as the solo cellist by Borusan Istanbul Philharmonic Orchestra. He is performing extensively with Turkish symphony orchestras as a soloist and also is a member of Borusan Quartet. Melih Kara, graduated from Hacettepe University State Conservatory in 1991 as a student of Nuray Eşen. In 1993, Kara received a Master’s degree on cello performance at Anadolu University in Eskişehir as a student of Azerbaijan State Artist Yuri Abdullayev. After, he got accepted to Genevre Conservatory in the level of Perfectionnement and had the opportunity to study with Prof. Daniel Grosgurin (a former student of Pierre Fournier). Kara completed the degree by winning the first price in the Virtuosite level and receiving Pierre Fernex special award. During his study, he played in the master classes of Mstislav Rostropovich, Janos Starker and Marcio Carneiro. Kara is teaching at the Anadolu University State Conservatory. Ozan Tunca, received degrees on cello performance from Hacettepe University State Conservatory (Bachelor Degree), Louisiana State University (Master’s Degree) and Florida State University (Doctorate Degree). Tunca’s cello professors were Doğan Cangal, Dennis Parker and Lubomir Georgiev. Ozan Tunca won the Hacettepe University Concerto Competition and performed Vivaldi’s Concerto for Two Cellos in G Minor and Dvorak’s Cello Concerto with the Conservatory Symphony Orchestra. His string quartet “alla Turca” was the recipient of the Eppes Foundation scholarship and won the Grand Prize in the NUMUS 2002 Chamber Music Competition in Canada. Tunca served as assistant principal cellist of the Baton Rouge Symphony and the principal cellist of the Antalya Chamber Orchestra and Louisiana Sinfonietta. He is currently teaching at Anadolu University State Conservatory in Eskişehir. Murat Berk, was accepted to Mimar Sinan University State Conservatory as Prof. Nusret Kayar’s student in the year of 1980. Six years later, he decided to continue his study at Hacettepe University State Conservatory with Prof. Ali Doğan. In 1990, Berk graduated from this school and won a position at Istanbul State Symphony Orchestra. By winning a scholarship, Berk went to Genevre Conservatory in 1993. During his study he was a student at the master classes of Mstislav Rostropovich, Misha Maisky, Janos Starker and had the opportunity to work in the Lozan Orchestra, Tibor Varga Chamber Orchestra and Genevre Chamber Orchestra. Murat Berk returned home in 1997 and he is currently working in Istanbul State Symphony Orchestra and Borusan Istanbul Philharmonic Orchestra.